Weight transfer is a critical aspect of skiing, simply because we have to transfer weight from one outside ski to another outside ski, as we keep turning across the slope. Transfer is one of the things we do in transition, a big part of Release transfer engage, as the skis need to be released and then engaged again, on the new set of edges. Sometimes considered part of pressure management, transfer deserves its own focus in training and learning. In high performance skiing, the skier generally is floating between turns and even though the new edges engage, there is no definitive weight transfer at that point and we can talk rather about "having transferred balance" to the new outside ski. Often, this balance transfer occurs so early that the skis are on the old edges, but at slow speeds, it's all weight transfer. The weight transfer should be smooth rather than jerky and the timing of it is also important, as if you transfer too much weight too early, you will skid the skis rather than smoothly engage the edges. This smoothness is critical especially on hard snow and ice, as the edges need to be "eased" into the new carve rather than weighted fully too early, which is what tends to cause them to break loose and the skier to skid out. This is often refered to as needing "patience at the top of the turn". The two general mechanisms to transfer weight from one foot to the other are flexing and pushing. You can push off the old foot and "land" on the new foot. Or, you can flex the old foot and thus transfer weight onto the new foot. 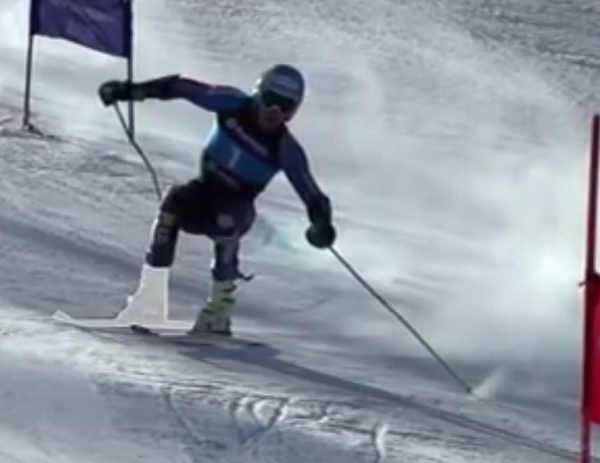 In skiing, the flexing is preferred, the higher the performance, the more flexing is required to counter the forces of the turn. Viewed 1118 times ( | Print ) this page.